December is on, Christmas trees all around and the holiday mood is hard to ignore. So why not get some your self? 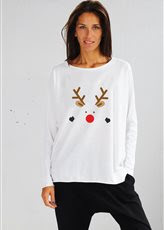 Don a warm blouse with season appropriate print - and soak in the Christmas mood! Original and mood lifting, these cozy printed blouses are the perfect holiday choice - both to wear and gift away. A beautiful Christmasсy print that draws the eye and a catchy naughty phrase that will bring a smile, they are an instant mood up-lifter. No ugly Christmas sweater choice any more - just the opposite, casually elegant and versatile, you can match them with anything. Interesting and colorful, when you want to escape boredom and to impress, just slip one. You can be comfy and warm, but far from ordinary. So go get some and ride the holiday wave with smile and confidence. Use promocode Christmas on checkout for 15% discount ;-) and enjoy the Christmas mood to the max.